We’ve got some crafty folks up in here! You guys sent me your current WIPS, and I’ve got to say I’m impressed! 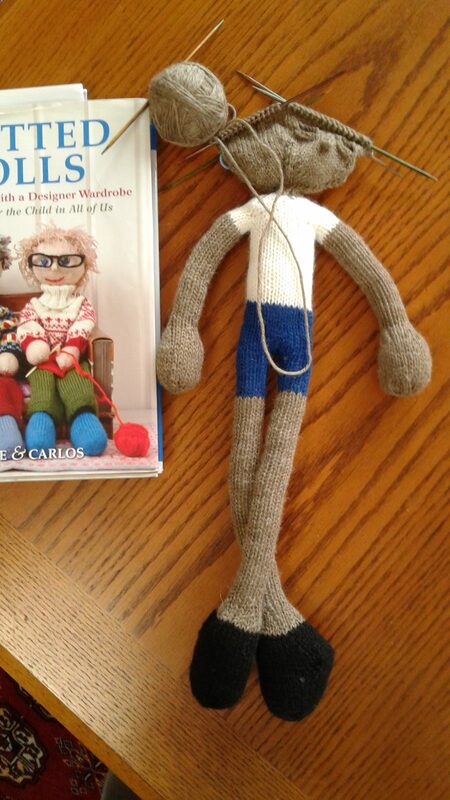 My mom (who’s always got something fun in the works), sent me a picture of her newest knitted doll from Arne and Carlos’s book. We took the doll class together last year at the Nordic Knitting Conference, which was super fun! Mom says that this doll is going to be the brother of the doll she made in the fall. 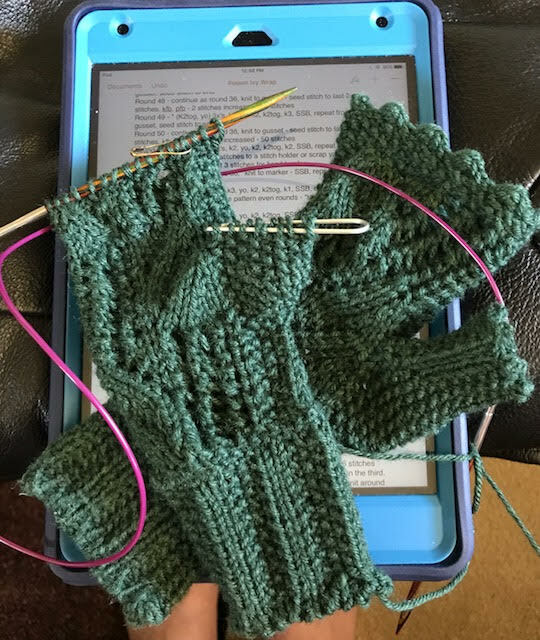 A reader, Yhenny, is making this pair of adorable lace gloves. She made the Poison Ivy Wrap from Rilana Riley-Munson. And, since she had a little yarn left over, she adapted the lace pattern to make matching mitts. How clever (and beautiful)! 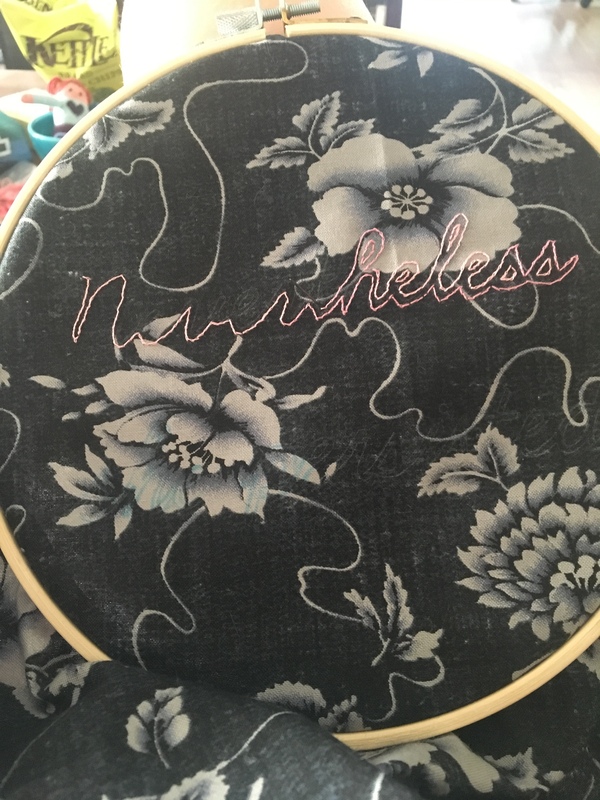 And, one of my old friends, Jenny, is working on a little “Nevertheless, She Persisted” embroidery. She’s a great embroiderer (is that a word… it doesn’t look right)- last Christmas she stitched a really adorable portrait of a family member’s cat. So far, she’s done the outline of her letters, and then she’s going to fill in the lines with satin stitch. I think it’s going to be really great. Thanks for sharing your projects! I love seeing what you’re all working on! This entry was posted in FYI and tagged Embroidery, fingerless gloves, knit dol, knit mitts, knitted doll, knitting, mitt, on your needles, wip on May 31, 2017 by onemilljellybeans.